Send 1/2 Kg Butterscotch Cake to Chennai. Gifts to Chennai. Send Cakes to Chennai. Description : If butterscotch is your brother's favorite flavor, then send this 1/2 Kg sponge round shaped butterscotch flavored cake to him on any occasion and festival in Chennai. 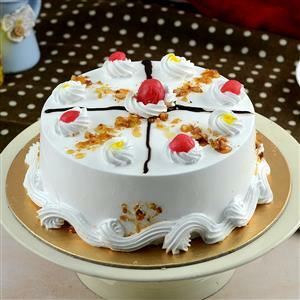 Along with this cake, you can team up other Gifts to Chennai and send through Gift2Chennai.com. Please Note : Picture is indicative. Actual will vary.